It always happens. Every time I open Google Earth to check something, I wander and end up in another part of the world. This evening I wound up “flying” over the little German town of Herbitzheim where my family lived when I was seven years old. My dad was in the Air Force at the time and he found a rental in the Alsace countryside near the French border. Looking at it now, I’m amazed how little things seem to have changed since then. 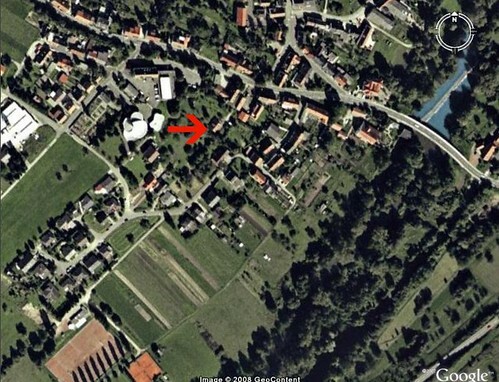 Our house, marked with the red arrow, is still surrounded by an orchard. (I remember throwing pears and apples … and stepping in rotted fruit.) The home of my sister’s friend Rosie is visible, too. I can also see the triangular block in the center of town where we caught the school bus, the little grocery store where I bought my first gummi bears (Gummibären) for a few pfennigs, and the big sportsplatz down Mozartstraße where German kids watched my brothers and I hit baseballs on the soccer field. I dug around for related ground photos and business names, too. (My gummi bear store is now known as Edeka Irmagard Rabung, by the way.) Finally, using the topography tool, I did what I always do in Google Earth: I slanted the satellite image to swoop down and fly around. 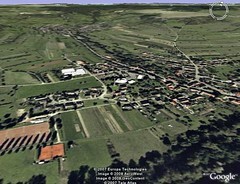 The virtual 3D photo at left includes Rubenheim, the neighboring town in the distance where our landlord’s friendly groundskeeper Oswald lived. I’ve been using Google Earth for two years, but I’m still blown away by the stuff technology allows us to do these days. Flying over my little childhood village this evening was a treat. Have you zoomed in on any of your old neighborhoods? This entry was posted on Wednesday, January 16th, 2008 at 6:03 pm and is filed under fun, gadgets. You can follow any responses to this entry through the RSS 2.0 feed. You can leave a response, or trackback from your own site. We too lived in Herbitzheim when I was assigned to Zweibrucken Air Base. We lived there between 1978-1981. I was assigned to the 26th Security Police Sq and to the Group Headquarters. We were the only Americans in the town and rented a place just like you described. A beautiful stone house in an orchord next to the home and property of Hintz and Bridget Motch. He was a wonderful man. We rented the place from the Koller sisters I think. Boardering the back of our property was Saint Barbara’s Catholic Church.